Stock Low : 338 items left. Cotton waffle front. Plain cotton reverse. 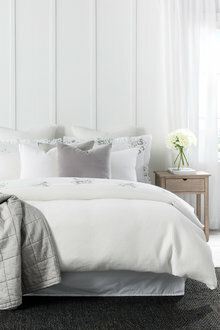 Suitable for any home or interior, the Darcy Waffle Duvet over Set will add an elegant minimalist edge to any room. Crafted from cotton, this soft waffle style comes in stylish white or charcoal and matches well with our range of European pillowcases. Perfect for the modern home, pair this set with any of the luxurious range of white sheet sets from Ezibuy Home's latest collection.